Directions: Take I-71/75 N and continue to follow I-71 N, entering Ohio. Take exit 24 for Kings Island Dr/Western Row Rd. Turn right at Western Row Rd (signs for Western Row Rd) and your destination will be on the right. Space Available No available lease space at this time, see flier for available land. 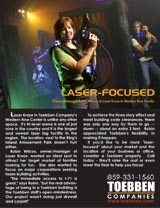 Get "laser-focused" with your business's location like Robin Wilcox did of Lazer Kraze in Toebben's Western Row.